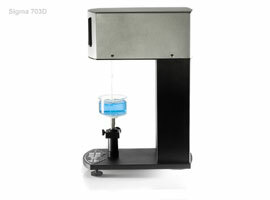 UK based Dyne Testing offer the Sigma 703D Force Tensiometer, a simple standalone and robust digital force tensiometer for accurate measurement of surface and interfacial tension. Manual critical micelle concentration (CMC) measurements can also be conducted. The Sigma 703D is extremely easy to use. With convenient control keyboard operations and open design there is no need for an external computer. Measurements are displayed in real-time on the large digital screen integrated into the instrument and can be transferred to a computer using the Data receiver software. For quick and reliable stand-alone operation and manual control, Sigma 703D is the best solution. 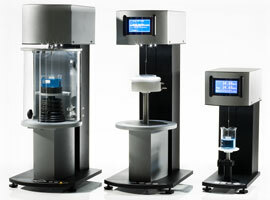 The major difference between the Sigma 703D and Sigma 702 models is the manual sample stage of Sigma 703D. 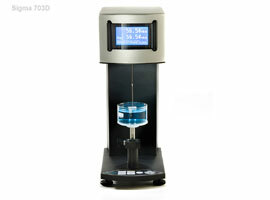 Simple, standalone and robust, the Sigma 703D is used for accurate measurement of surface and interfacial tension of liquids. 1GHz processor, 1GB MB RAM, 40 GB hard disk drive (20GB free), 1 USB port. Accessories such as water bath and liquid dispenser may require a free RS-232 port. Windows 7 & 8 (32 or 64 bit), Windows Vista (32 bit), Windows XP SP3 (32 bit). For accessory details please refer to the list below or contact our Sales Team for assistance.